"A high-octane thriller . . . Nyxia grabs you from the first line and never lets go." --Marie Lu, #1 New York Times bestselling author of Warcross Every life has a price in this sci-fi thriller--the first in a trilogy--that has the nonstop action of The Maze Runner and the high-stakes space setting of Illuminae. What would you be willing to risk for a lifetime of fortune? Emmett Atwater isn't just leaving Detroit; he's leaving Earth. Why the Babel Corporation recruited him is a mystery, but the number of zeroes on their contract has him boarding their lightship and hoping to return to Earth with enough money to take care of his family. Forever. Before long, Emmett discovers that he is one of ten recruits, all of whom have troubled pasts and are a long way from home. Now each recruit must earn the right to travel down to the planet of Eden--a planet that Babel has kept hidden--where they will mine a substance called Nyxia that has quietly become the most valuable material in the universe. But Babel's ship is full of secrets. And Emmett will face the ultimate choice: win the fortune at any cost, or find a way to fight that won't forever compromise what it means to be human. "The 100 meets Illuminae in this high-octane sci-fi thriller." 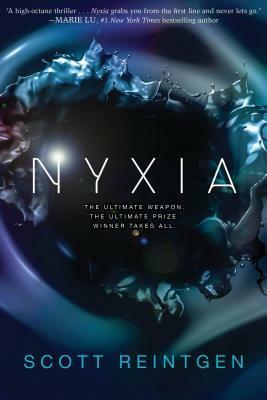 --Bustle AND DON'T MISS NYXIA UNLEASHED! Scott Reintgen has spent his career as a teacher of English and creative writing in diverse urban communities in North Carolina. The hardest lesson he learned was that inspiration isn't equally accessible for everyone. So he set out to write a novel for the front-row sleepers and back-row dreamers of his classrooms. He hopes that his former students see themselves, vibrant and on the page, in characters like Emmett. You can follow him on Facebook, on Instagram, and on Twitter at @Scott_Thought.